If a menu item is "grayed" out, it means that that option is not available under the current recording condition. DO NOT EXPOSE your camcorder's lens or LCD viewfinder to the sun for extended amount of time as it will damage them. Be sure and use the Lens Hood and an LCD Hood if filming in sunny conditions. 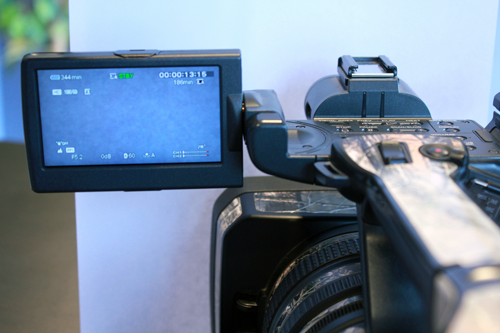 Temperature - The camcorder is not recommended in weather conditions below 32º as it can affect your recordings. To solve this you can get a Polar Mitten Cover that allows you to place heat warmers in it to keep your video camera warm. Batteries will be effected when the temperature reaches below 32º, and the battery life will go down. It is important to a) keep your batteries warm and b) have extra batteries when filming in colder situations. I recommend formatting your SD cards when they are new, and when reusing the cards. ALL DATA RECORDED ON THE MEMORY CARD WILL BE ERASED BY FORMATTING, AND CAN NOT BE RECOVERED. Save important data on the memory card on other media such as a computer, before formatting the memory card. Like your trusty 12 gauge, the Sony HXR-NX5U is a camera that can handle any situation. It contains all the features of the AX2000 (72mm lens, 3-1/3" CMOS chips, 2 XLR ports, 2 SD card slots and a 1.5 lux) plus more. Its built in GPS can direct you back to the exact spot you made the shot from, perfect for recreates or for B-roll footage. Two accessories shoes on the top handle make it even easier to attach a wireless mic or other accessories. Perhaps the biggest draw of the NX5U is the option to add on the FMU 128. It is an additional storage device capable of holding 11+ hours of video while you are simultaneously recording to the SD cards giving you an instant back-up of all your recordings. An included shotgun mic and XLR cable round out this set-up to make it the complete package for anyone seriously into outdoor filming. 2) Take your memory card with the notched corner facing down, and insert into the memory card slot until it clicks. 3) Repeat with memory card slot B. *Formatting deletes all data from the memory card to recover recordable free space. * YOU CAN NOT RECOVER LOST FILES AFTER YOU FORMAT THEM!!! Press the A or B button of the memory card slot where the memory card you want to record on is inserted. The lamp of the selected slot lights up in green. You can only select a slot that already has a memory card inserted. While movies are being recorded on the memory card, you cannot switch the slot even if you press the memory card slot A/B button. If you only have one memory card inserted, the slot that has the memory card is selected automatically. Lightly push the memory card once. When the light by the card is flashing red, your camcorder is reading/writing data. DO NOT shake or knock your camcorder, turn the power off, eject the memory card, or remove the battery pack. Otherwise, image data may be damaged. Insert memory cards each in both slots A and B, so the camcorder switches memory card A and B, so the camcorder switches memory card A (or B) just before space on the other one runs out, and continues recording on the next memory card automatically. *Do not eject the memory card that is currently being used for recording. Replace only the memory card whose slot lamp is off. • Even if you press the memory card slot button, A or B, while recording, you cannot switch the slot currently being used. • If you start recording on a memory card with the remaining recording time less than 1 minute, the camcorder may not be able to relay-record. You can select the recording format (bit-rate, image quality, image size, frame rate, scanning system). Press MENU -> select REC/OUT Set -> REC FORMAT with the SEL/PUSH EXEC dial. The Sony HXR-NX5U has three options for adjusting the zoom to make it easy no matter how you are filming. 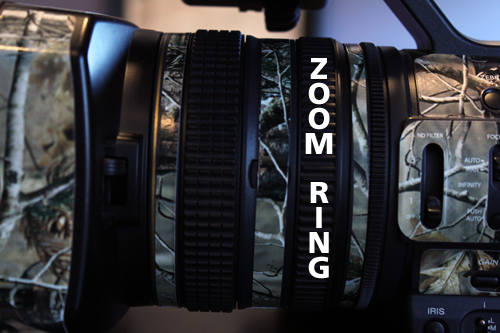 The power zoom lever is located on the side of the camera with the hand strap. While hand is in strap you can use your pointer and middle finger to adjust the zoom. 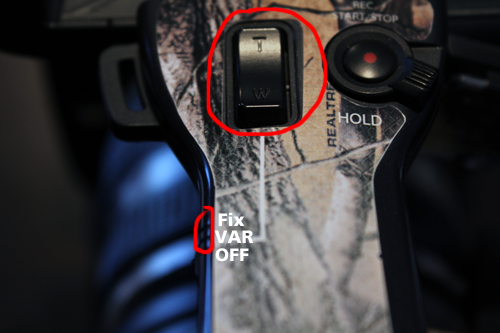 1) Set the handle zoom to VAR of FIX on the side of the handle. VAR- allows you to zoom in or out at a variable speed. FIX- allows you to zoom in or out at a fixed speed. You can zoom at the desired speed by turning the zoom ring. Fine Adjustment is also possible. You can adjust the focus manually for different recording conditions. A person symbol appears when you cannot adjust the focus any closer. * It is easier to focus on the subject when you use the zoom function. Move the power zoom lever towards T (telephoto) to adjust the focus, and then, towards W (wide angle) to adjust the zoom for recording. [EXPANDED FOCUS] is assigned to the ASSIGN 7 button. 1) Press the ASSIGN 7 button. 2) [EXPANDED FOCUS] appears and the center of the screen is magnified by about 2.0 times. 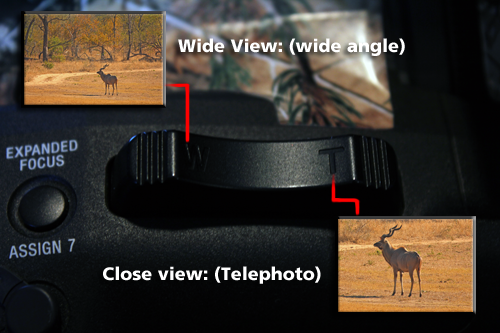 it will be easier to confirm the focus setting during manual focusing. The screen returns to the original size when you press the button again. 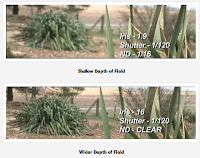 You can adjust the image brightness by adjusting the iris, gain, or shutter speed, or by reducing the light volume with the ND (neutral density) filter. 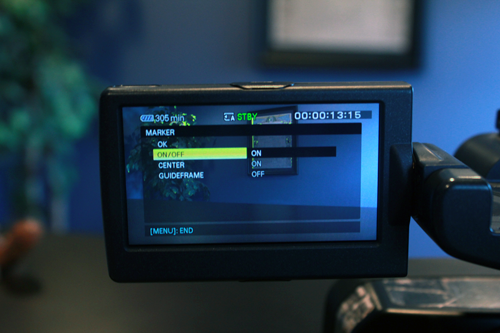 1) During recording or standby, set the AUTO/MANUAL switch to MANUAL. 2) Press the IRIS button and the A (automatic) next to the iris value on the LCD screen disappears, or the iris value(F-stop number) appears on the screen. 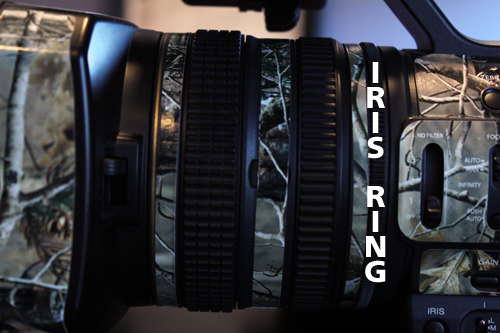 3) Adjust he iris with the IRIS ring to the F-stop that you are looking for. 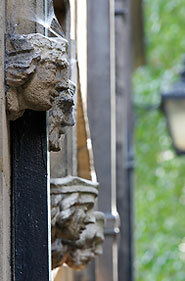 * The range of focus, an important effect of the aperture, is called Depth Of Field. 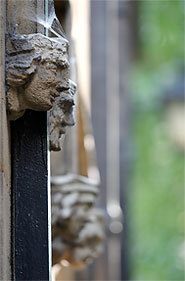 The depth of field gets shallower as the aperture is opened, and deeper as the aperture is closed. Use the aperture creatively to obtain the desired effect in your outdoor videography. This is handy for making your background blurred or sharp. Press the IRIS button until the A (automatic) appears next to the iris value (f-stop) on the LCD screen, or set the AUTO/MANUAL switch to AUTO. * When you set the AUTO/MANUAL switch to AUTO, other manually adjusted items (gain, shutter speed, white balance) also become automatic. 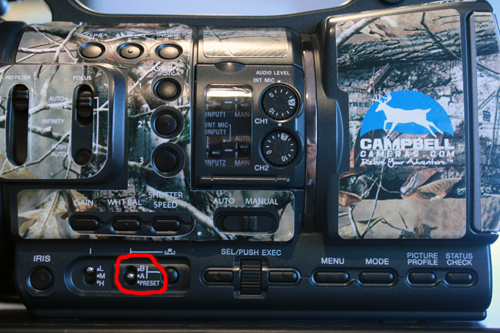 You can select a upper limit for the AGC so that during automatic mode, the Gain wont go above a certain dB. You can select [OFF], 21dB (default setting), [15dB], [12dB], [9dB], [6dB], [3dB], and [0dB]. 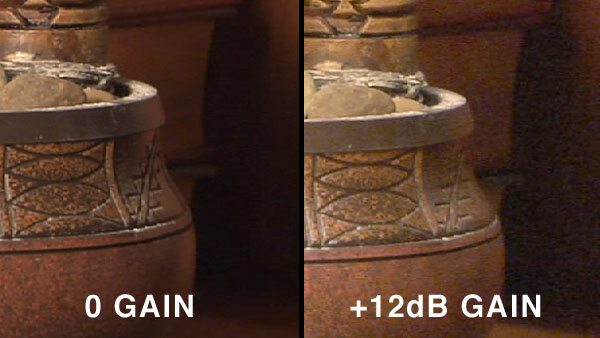 *For broadcast practices, I recommend never exceeding 12dB. For personal use, you can select as high as gain as you want, but remember the more gain you add the more pixilated and dotty your image becomes. 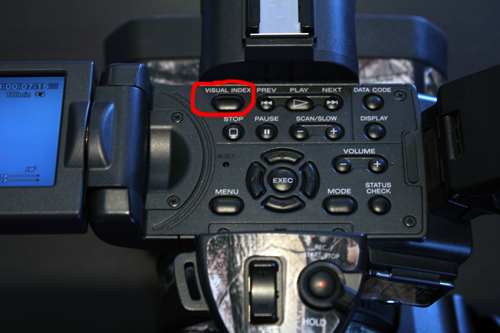 The NX5U gives you 3 assignable Gain buttons (L,M,H) that you can pick (on manual mode) to set the gain to that while filming. You can set the values for H, M, and L positions of the GAIN switch. 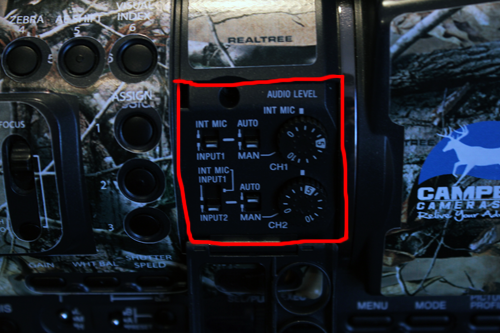 The default settings of H is 12dB, M is 9dB, and L is 0dB. 5) Set the dB for the letter you chose. 6) Press MENU button to hide your settings. 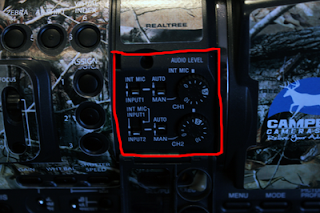 You can adjust the gain manually when you do not want to use the AGC (automatic gain control). 2) When the gain is automatically adjusted, press the gain button. The A (automatic) next to the gain value on the LCD screen will disappear, or the gain value appears on the screen. 3) Set the gain switch to H, M, or L. The gain value set for the selected gain switch position appears on the screen. You can manually adjust and fix the shutter speed. You can make a moving subject look still or emphasize the movement of a moving subject by adjusting the shutter speed. This is important to play with around moving objects such as cars, water, and people/animals. Play around with this feature to determine the creative look that you are looking for. 3) Change the shutter speed displayed on the screen by turning the SEL/PUSH EXEC dial. You can adjust the shutter speed displayed on the screen by turning the SEL/PUSH EXEC dial. You can adjust the shutter speed in a range of 1/4 second through 1/10000 second. The denominator of the set shutter speed appears on the LCD screen. 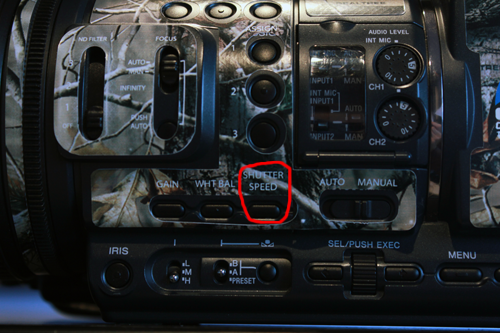 4) Press the SEL/PUSH EXEC dial to lock the shutter speed. *You can set a shutter speed between 1/3 second and 1/10000 second with the frame rate of 24p or 24p SCAN. *ALWAYS use a tripod or a camera support system when adjusting shutter speed because it is difficult to focus automatically at a lower shutter speed. Manual focusing with your camcorder attached to a tripod or camera support system is what I recommend. * When filming under fluorescent lamps, sodium lamps, or mercury lamps, the picture may flicker or change colors, or you man have horizontal bands of noise. You may be able to improve the situation by adjusting the shutter speed. 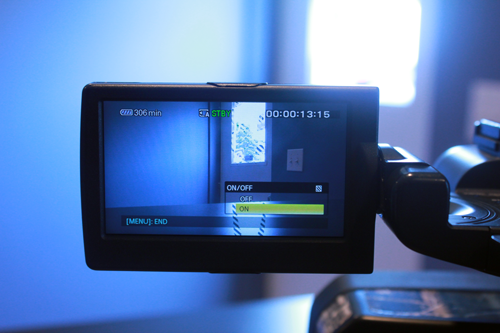 You can record the subject clearly by using the ND filter when recording environment is too bright. 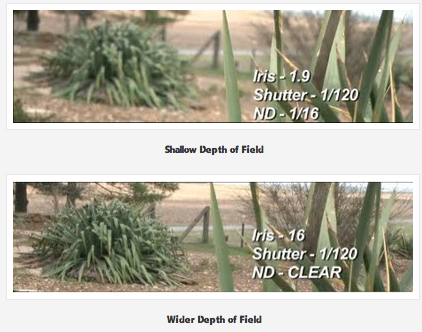 The ND Filters 1, 2, 3, reduce the volume of light to about 1/4, 1/16, and 1/64 respectively. During automatic mode an ND1, ND2 or ND3 will flash on the LCD screen suggesting that you set the ND filter respectively. Notice how the clouds become more pronounced as the ND Filter is increased. 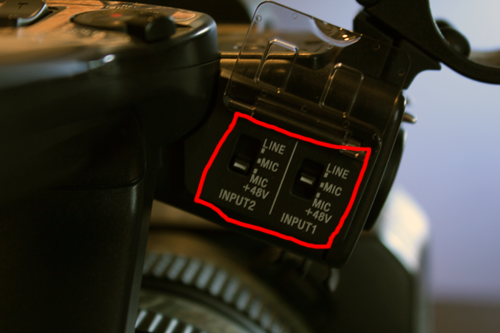 *IF you change the ND filter while recording, the movie and the sound may be distorted. * While recording a bright subject, diffraction may occur if you close the aperture further down, resulting in a fuzzy focus (this is common phenomenon with video cameras). The ND filter suppresses this phenomenon and gives better recording results. 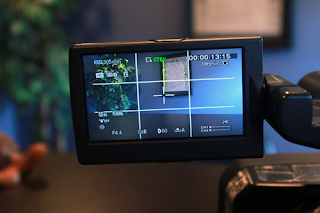 You are going to want to adjust the white balance according to the lighting conditions of your recording environment. The NX5U allows you to store two white balance presets (good if you are filming in the same location with the same lighting as in a studio setting). White balance values adjusted for light sources can be stored in memory A and memory B. Unless a white balance is readjusted, values will remain even after the power has been turned off. There is another preset for Outdoor which is good when recording neon signs or fireworks, sunset/sunrise, just after sunset or just before sunrise, and under daylight color fluorescent lamps. There is also a preset for Indoor which is good for shooting under the lighting conditions that change in many ways, such as a party hall, under strong light as in a photography studio and under sodium lamp or mercury lamps. 2) Press the WHT BAL button. 3) Set the white balance memory switch to A or B (whichever one you want to set). 4) Capture a white subject, such as white paper, full-screen in the same lighting condition as the one in which the subject is. Press the White Balance symbol button once. A or B starts flashing rapidly. It will stay on when the white balance adjustment is completed and the adjusted value is stored in A or B. You can also manipulate what the camera "sees" as white for more creative controls. *The best way is to get out there and practice setting your white balance outdoors and using different scales of white, grey and black to manipulate the camera and then see how the color of what your recording changes. You can customize the picture quality by adjusting picture profile items such as GAMMA and DETAIL. 2) Select a picture profile number with the SEL/PUS EXEC dial. Creates a look similar as when a film-originated movie is viewed on television. The slope of the gamma curve in dark areas is suppressed, creating a deep black tone, while the mid-tone to highlight areas maintain detailed contrast. Suppresses the dark areas even further, creating a deeper black reproduction. [TYPE] Selects a type of colors. [LEVEL] Sets a color level when you set [TYPE] to the settings other than [STANDARD]. [LB[COLOR TEMP] Sets a color temperature offset value. [CC[MG/GR]] Sets a color correct offset value. [LEVEL] Sets the adjustment level. [PHASE] : Sets the color phase. [RANGE] : Sets the color range. [SATURATION] : Sets the color saturation. The NX5U incorporates the XLR ports for audio that allow you to use simultaneously a wireless mic and shotgun microphone. The NX5U includes a shotgun microphone and XLR Cable. 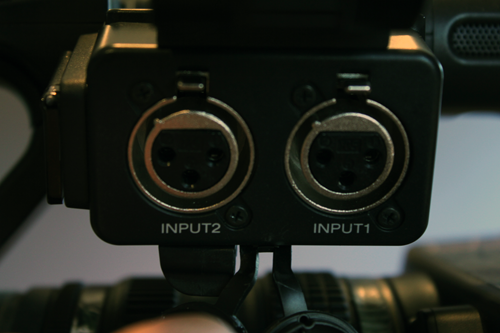 1) Select input sources with the CH1 (INT MIC/INPUT1) switch and the CH2 (INT MIC/INPUT1/INPUT2) switch. • CH2 is set to INT MIC then the L INT Mic is being recorded on CH1 and the R INT MIC is being recorded on CH2. • CH2 is set to INPUT 1 then mono INT MIC is being recorded on CH1 and XLR INPUT1 is being recorded on CH2. • CH2 is set to INPUT 2 then mono INT MIC is being recorded on CH1 and XLR INPUT2 is being recorded on CH2. • CH2 is set to INPUT1 then XLR INPUT1 is being recorded on CH1 and CH2. 2) Set the INPUT 1 switch to an appropriate position for the microphone connected to the INPUT1 jack. MIC+48V: For inputting sound from a device that supports the +48V power source. When you connect a microphone to the INPUT2 jack, set the INPUT2 switch to an appropriate position for that microphone. Some functions can be assigned to the ASSIGN buttons for easy use. You can assign a single function to any one of the ASSIGN 1 to 7 buttons. 7) Press the MENU button to hide the menu screen. The VISUAL INDEX screen appears after a few seconds. 3) Your camcorder starts playing the selected movie. You can save a selected frame from a recorded movie as a still image. 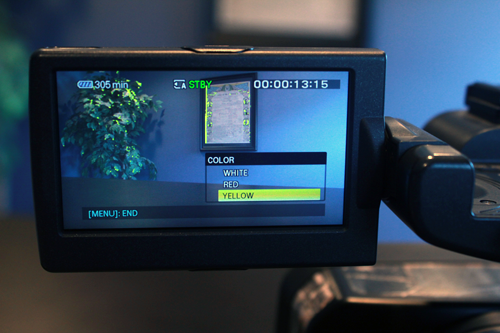 2) (on the LCD screen) Touch [EDIT] –>[PHOTO CAPTURE] –> select the desired memory card and image quality. The captured still image is saved on the memory card selected for movies. When capturing is finished, the screen returns to pause. You can continue to capture still images by press play again and repeat steps 4. Zebra: You can display a zebra pattern as a guide for adjusting brightness. 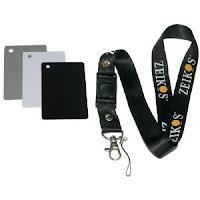 • ON/OFF : when you select ON the Zebra strip icon and the brightness level appear on the screen. The zebra pattern will not be recorded with the image. The default setting is OFF. • LEVEL: You can select the brightness level between 70 and 100 and 100+. The default settings is 70. 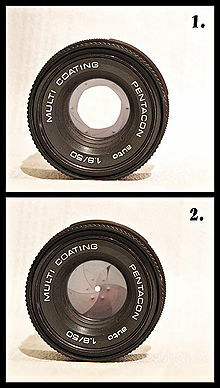 Peaking is used to help adjust the focus. When peaking is activated, edges in focus on the screen will be highlighted in red, yellow or white. *The enhanced outline will not be recorded on the memory card. *You can focus more easily using this function in combination with the expanded focus function. Markers are used to help frame your shot. • ON/OFF: When you select ON, you can display markers. The default setting is [OFF]. Markers will not be recorded on the memory card. STEP 2) Installing the supplied software "Content Management Utility"
• Install "Content Management Utility" before connecting your camcorder to a computer. 2. Turn on your computer. 3. Place the supplied CD-ROM "Content Management Utility" in the disc drive of your computer. The installation screen appears. 9. Turn on your camcorder, then connect the camcorder to the computer using the supplied USB cable. 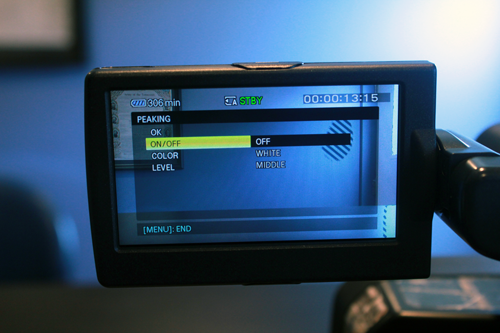 The USB SELECT screen appears on the camcorder screen automatically. 10. Touch A or B on the camcorder screen. 12. Follow the on-screen instructions to install the software. 13. After installation, you are free to use the software to transfer your footage from the camcorder to the computer. Item Reviewed: Guide To Using The Sony HXR-NX5U 9 out of 10 based on 10 ratings. 9 user reviews.